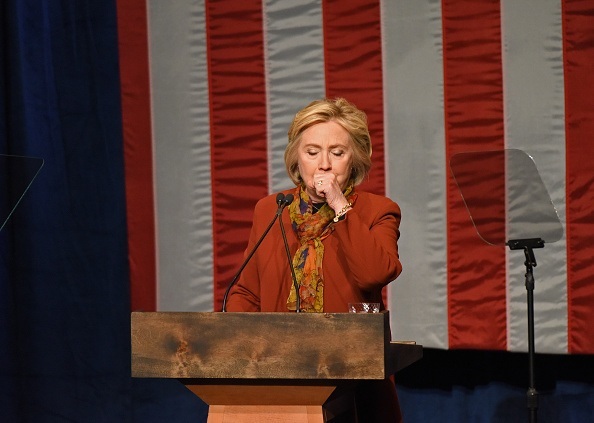 Every five minutes the woman who wants to be the next President of the United States because of her ‘experience’ and ability to work under pressure said she did not remember basic ideas about our national security and handling classified information. 39 times in just under three and a half hours Hillary Clinton told the FBI earlier this year that when it came to classified briefings, how to handle classified information, how and why her private email server was set up and so forth she just could not recall the answers to any of those questions. For you Conservatives yelling she’s lying, stop. She may be telling the truth this time. In fact it may be much worse because she blamed a serious head injury she suffered for her inability to recall many of those specific details about her time as Secretary of State over and over again. My God, the woman admits she cannot recall the basic guidelines of the duties to protect American intelligence in part because of a serious concussion and she still seeks the office with the blessing of millions of Democrats? What honest person whether liberal, conservative or right down the middle could possibly swallow this load of garbage? -Clinton could not recall a specific process for nominating a target for a drone strike. -Clinton did not recall using a flip phone during her time as Secretary of State. -Clinton did not recall how any data stored on her Blackberry device was destroyed. -Clinton could not recall why State was unable to provide her with a secure Blackberry. -Clinton did not recall receiving any emails she thought should not be on an unclassified system. -Clinton did not recall her specific conversations regarding the creation of the clintonemail.com domain. -Clinton did not recall receiving guidance from State regarding email policies outlined in the Foreign Affairs Manual. -Clinton did not recall any specific routine for deleting email from her account while Secretary of State. -Clinton did not recall a specific cable about securing personal email accounts sent to employees. -Clinton did not recall that the cable correlated with Bryan Pagaliano upgrading the clintonemail.com email server. -Clinton did not recall ever contacting Pagaliano for technical support for her email account. -Clinton did not recall specifically who had access to Clinton’s Blackberry and email accounts. -Clinton did not recall any other individuals being offered an account on clintonemail.com besides Huma Abedin. -Clinton stated she did not recall the compromise of State employees gmail accounts. -Clinton did not recall using an iPad mini until after her tenure as Secretary of State. -Clinton did not recall Jacob Sullivan using his Google email account for official business. -Clinton said she did not recall a specific FOIA request on an email dated December 11, 2012. And finally, Clinton did not recall specifically who made recommendation to change her email address after it was publicly disclosed in March 2013. By her own admission she is not capable of being President. She admitted that she couldn’t remember the basic tenets of national security or the salient facts of basic briefings because of the traumatic brain injury she suffered while she was Secretary of State. My God- does she even remember the call for help from Benghazi? Or is that just a hazy dream that doesn’t seem real? More disconcerting at this point in the conversation is there are numerous studies that clearly show adults over 65 that suffer mild or moderate traumatic brain injury are at a far elevated risk of developing dementia, loss of short-term memory and a host of other problems that can become permanent. According to University Health News another concern is the use of blood thinners like Coumadin. Hillary Clinton still takes Coumadin according to published reports. UHN included this: The consequences of a concussion can be serious. Older adults especially can develop problems with infection, blood pressure, and glucose control. Those who take blooding-thinning medications may have an increased risk of internal bleeding. Questions about Hillary Clinton being physically capable of doing the job of President are not the product of some vast right wing conspiracy unless you consider respected medical journals part of the plot. Clinton opened the door to the questions about her mental health and competence. Clinton is the one who blamed her Traumatic Head Injury for failing to protect US secrets or even remembering whether she was ever briefed on such protocols. Trust me, I won’t forget to keep asking these very important questions.